This fuzzy medium sized dog breed resembles a sheepdog. Its long thick fur covers every nook and cranny of its body including underneath its feet and on its face. Tibetan Terriers have snowshoe-like flat feet which help them have better traction in the snow. 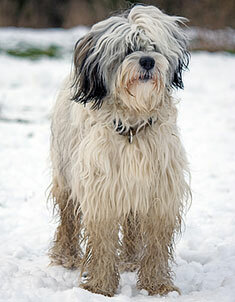 The Tibetan Terrier dog breed may be any color or combination of colors, including white. The Tibetan Terrier must be bathed regularly - once every week and brushed every 2-3 days. The coat must be first sprayed with water or conditioner in order to ensure smooth and comfortable brushing. Tibetan Terriers are prone to Progressive Retinal Atrophy and cataracts and are also extra susceptible to fleas. 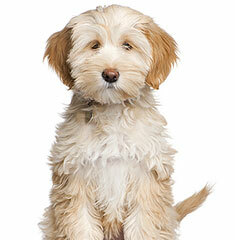 The Tibetan Terrier can be expected to live about 12-15 years. The Tibetan Terrier can do well with a small yard. Tibetan Terriers are relatively inactive indoors and require some form of exercise in order to remain happy and healthy. Find Tibetan Terrier Puppies with our Free Breeder search!